CUCUTA, Colombia (AP) — Dozens of volunteers prepared sacks of rice, canned tuna and protein-rich biscuits for malnourished children at a warehouse on the Colombian border on Friday as Venezuela's opposition vowed to deliver the U.S. humanitarian aid to their troubled nation, even if it means mounting a mass mobilization of their countrymen to carry it in. 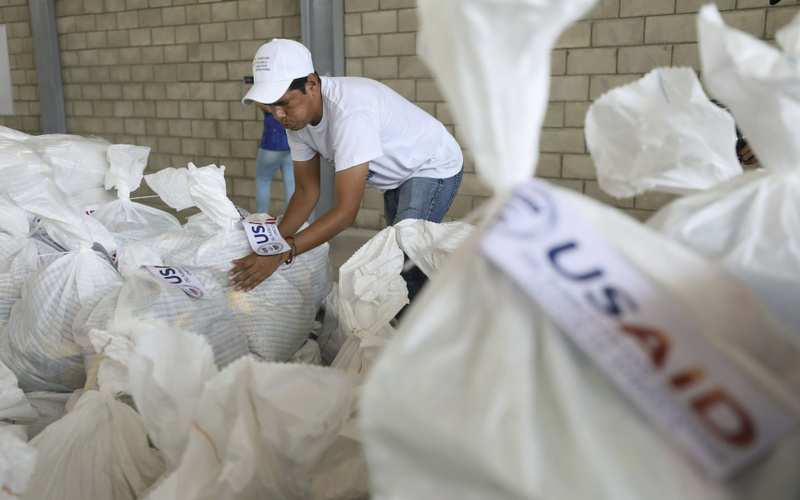 As the food and hygiene kits were packed into individual white bags in the city of Cucuta, just across the river from Venezuela, U.S. officials and Venezuelan opposition leaders appealed to the military to the let the aid through. Lester Toledo, who is representing opposition leader Juan Guaido in the aid mission, issued a message to troops, telling them the aid contains food and medicine their own families need. He recalled how in 2016, a large group of Venezuelan women dressed in white and intent on crossing the closed border with Colombia made their way through a line of national guardsmen in order to buy food on the other side. "I am convinced that the way we are going to pass this aid is with the Venezuelan people," Toledo said at a press event unveiling the aid. "People, people and more people bringing in humanitarian aid." The emergency supplies have become the focus of Venezuela's political struggle between President Nicolas Maduro and Guaido, who declared interim presidential powers in late January, accusing Maduro of being illegitimate following an election last year widely viewed as a sham. The Venezuelan military has blocked the bridge where the aid is stationed and Maduro is refusing to allow it in. The embattled Venezuelan leader dug in further Friday, contending the aid is part of a coup being orchestrated by the U.S. government. "There's an attempt to violate our national sovereignty with this 'show' of a humanitarian operation by the government of Donald Trump," he said. The goods, including packaged corn flour, lentils and pasta, arrived Thursday in what the opposition is hoping will be the first of many shipments of humanitarian aid from countries around the world. Opposition leaders said three countries in the region will become aid hubs and that some nations, like Colombia, will likely have more than one collection site. The first shipment includes food kits for 5,000 Venezuelans and high-protein nutritional supplements that can treat an estimated 6,700 young children with moderate malnutrition. Additional aid is being stored in Miami and Houston and "ready to be deployed to the region immediately," the U.S. said in a statement. "We expect more to come," U.S. Ambassador to Colombia Kevin Whitaker said. "This is a down payment." Asked what would happen if the Venezuelan military blocks the aid from going in, Whitaker said any obstacles would be dealt with as they arise and reiterated that Trump has made clear nothing is off the table — though, he added, the priority is to arrange a broad international mission. Whitaker said the U.S. involvement stops at the Colombian border, where the Guaido-led opposition will be charged with distributing the aid inside Venezuela, a seemingly tall task as Maduro shows no signs of conceding. Opposition leader Jose Manuel Olivares, who is in Cucuta helping coordinate the aid mission, said the idea floated by Toledo to use a mass mobilization of people to get the aid across the border is one of the strategies being considered. "The aid is going to be backed by popular support, by hundreds and thousands of people who need it," he said. A growing list of nearly 50 countries has thrown their support behind Guaido. On Friday, Romania's president became the latest world leader to recognize Guaido as interim president almost a week after other European Union countries did so. President Klaus Iohannis said Romania decided to join other EU countries in recognizing Guaido partly because Bucharest currently holds the EU's rotating presidency. Speaking at the Central University of Venezuela Friday, Guaido called on Venezuelans to hold popular assemblies in their towns this weekend to organize volunteers to receive the aid and called on the military to let the supplies through. "If they dare to continue blocking the way, all these volunteers will go open a humanitarian channel," he said. Guaido declared himself Venezuela's interim president Jan. 23, maintaining that the constitution gives him that right as head of the opposition-controlled National Assembly because Maduro's re-election should be considered legitimate. On Friday, Supreme Court Justice Juan Mendoza challenged that assertion, saying the constitution does not include language for forming a transitional government as Guaido claims. Steps the lawmaker has taken are therefore void and he is usurping presidential powers, Mendoza said. The pro-Maduro Supreme Court has already barred Guaido from leaving the country and frozen his bank accounts while prosecutors investigate what they call his anti-government activities.